Coca-Cola's push to focus less on high-calorie drinks seems to be paying off. The beverage giant reported earnings and sales that topped forecasts on Wednesday and it was led by growth from its new Coca Cola Zero Sugar product as well as coffee and tea drinks, particularly in the United States. The company's overall revenues were dinged by Coke's decision to refranchise some of its bottling operations. But excluding that, sales rose 4% worldwide. Coke (KO) said that sales in North America were up 3% from a year ago. That may not sound like a great accomplishment but it's actually solid growth for a company of Coke's size. Plus, the U.S. beverage market is pretty saturated. Coke also said that its market share was up and that's a testament to both Coke's sales gains and a drop reported by its key rival. Pepsi (PEP) said earlier this month that its soft drink sales in North America actually fell slightly. Pepsi CFO Hugh Johnston told CNNMoney after its latest earnings report that the main reason for the slide was because the company focused more marketing efforts on newer, low-calorie products and less on core brands like Pepsi and Mountain Dew. Interestingly, Coke said that sales volume for its Mountain Dew rival, Sprite, were up in the third quarter. And another Coke competitor -- Dr Pepper Snapple (DPS) -- posted weak sales on Wednesday, blaming the impact of recent hurricanes and earthquakes in Mexico for the sluggish performance. But Coke CEO James Quincey, who succeeded long-time chief executive Muhtar Kent earlier this year, said he was pleased with his company's results, particularly since they come while the company is "making substantial structural and cultural changes." Along those lines, Coke is making a bigger push beyond its core cola drinks. Coke is now partnering on coffee drinks from Dunkin' Brands (DNKN) and McDonald's (MCD) that are sold in supermarkets -- a clear challenge to Starbucks (SBUX). Coke also announced earlier this month that it was buying the popular Mexican-based maker of sparkling water, Topo Chico. That move led to a big drop in the stock of LaCroix owner National Beverage (FIZZ). And National Beverage's CEO Nick Caporella put out a bizarre press release last week to defend the company's recent performance. The release concluded with this strange proclamation. "If you have the opinion that I, Nick A. Caporella, am angrily exercised while extremely fortunate to be guiding FIZZ, your opinion is quite accurate!" National Beverage's iconic brands are the genuine essence . . . of America. "Patriotism" -- If Only We Could Bottle It! WE SPARKLE . . . AMERICA SMILES!" Coke, of course, doesn't self-promote in such a fashion. It doesn't have to, given how iconic the company is in the U.S. But Coke is also a global giant -- and its sales in emerging markets are gaining steam too. The company said Wednesday that another reason for its solid overall sales was due to a jump in revenue in China, India and South Korea. 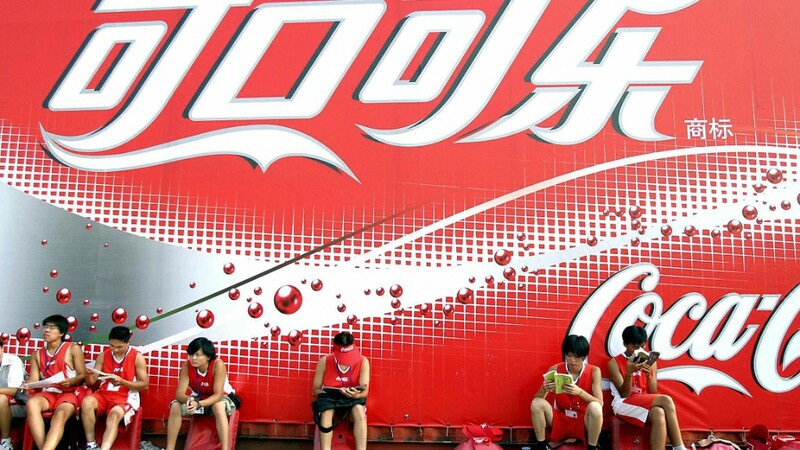 Coke shares fell slightly Wednesday despite the better than expected results. But the stock is still up 11% this year and is outperforming Pepsi and Dr Pepper Snapple.